In this economy, where countless people don’t have jobs, can’t find jobs, or have jobs, but are barely making enough to survive, things can become incredibly stressful. Sometimes it gets so financially rough that people turn to whatever they can to get out of debt and above water again. For a number of those people the only method to get everything sorted, even if for a short time, is to look to bankruptcy. It’s not ideal for anyone, but if you’re in a rough financial spot, it might be your best option. So how does it work? Deciding to file bankruptcy means a lot more than most people realize – and you can’t do it alone. Putting aside some time to find a good bankruptcy attorney will help you out more than you know. First of all, they can go over the entire process with you and provide a step-by-step guide which will help ease some of the stress. Though, it’s not always as easy as simply asking questions. You’ll have to gather up all bills and any other financial documentation and bring them to your bankruptcy attorney so they know exactly what kind of bankruptcy you should file. It’s best to be helpful and be a part of the process. When you decide you need to file, a bankruptcy attorney will make sure you know which type you need to file under. The two most common types are Chapter 7 and chapter 13. 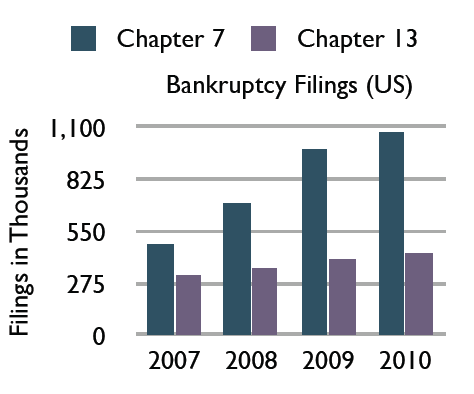 Chapter 7 is the most common type of bankruptcy and is known by its liquidation of assets. In short, you sell off a lot of properties in order to pay off your debts and get back on your feet. There is a list of exempt items, but it varies from state to state. The right attorney will know what you can keep and what has to be sold, and they’ll be able to tell you what happens with secure loans such as car payments. When it comes to filing a chapter 13 bankruptcy, the process is a bit different as you agree to pay part of your debts. If you want to qualify for chapter 13, you need a reliable source of income so you can make payments, but if you can, it might be better for you than a chapter 7, as you save most of your property from liquidation. If you find yourself in need of filing for bankruptcy, then finding a good bankruptcy attorney can be the most important part of the process. They know what needs to be filed and how to file the proper documents. They also just exactly what type of bankruptcy is right for you. Don’t do this alone! It can be stressful, and it’s easy to take the wrong step. Get some professional help and ease some of the burdens. The most common types of bankruptcy filings for consumer debtors are Chapter 7 and Chapter 13. Both of these types of bankruptcy cases have certain qualifying requirements. This article discusses the requirements for a Chapter 7 bankruptcy. In 2005 Congress revamped the Bankruptcy Code, adding certain requirements for consumer debtors. For example, no matter what type of bankruptcy you file, if you are an individual (as opposed to a corporation or other entity), you must complete a Credit Counseling Course prior to filing your petition, and additionally complete a Debtor Education Course after your case is filed and before you receive your discharge. In addition, in Chapter 7 cases, you must now pass the Means Test. In this Part I of a series of articles on the Means Test, we will look at the Median Family Income. The Means Test examines your household income (and certain allowed deductions) and compares it to the Median Family Income as published by the Census Bureau. This number is updated every year and is specific to the State in which you file your bankruptcy. For example, as of the writing of this article (May 2012), the Median Family Income in California is $49,188 for a household of one person, $63,481 for a two-person household and $77,167 for a four-person household. This means that if you are married and have two children (under 18), and you and your wife make less than $77,167 combined per year, you will automatically pass the Means Test and qualify for a Chapter 7. If, however, you make more than that amount, you may still be able to qualify for a Chapter 7 bankruptcy after certain deductions are taken (this will be discussed in a future article). On the other hand, if after all the deductions are taken, your income is still above the Median Family Income, you will most likely not qualify for a Chapter 7, but may still be able to file a Chapter 13 (depending on certain other criteria). Q: Do the qualifying figures change whether my spouse is working or not? A: Your income is calculated as to your entire household. If you are the only one working, you will enter that income into the Means Test. If both you and your spouse are working, then your combined income is used. Q: What if I file the bankruptcy on my own, without my spouse, what figures are used? A: Whether you file the bankruptcy on your own or jointly with your spouse, the figures used in the Means Test do not change. Your combined household income is used in the Means Test no matter whether you file alone or jointly. Further, the Median Family Income figure is based on your State and family size, and does not change depending on whether or not you file the petition jointly. Q: What if I am married and have more than 2 kids (family size is larger than 4)? A: Assuming you file your petition in California, for each additional member of the family add $7,500 to the Median Family Income figure. For example, if you are married and have 3 children, the Median Family Income for the purposes of the Means Test is $$84,667. Q: Are only parents and children counted as family members? A: If you are taking care of an elderly parent, for example, that person could potentially count as a member of the family for the purposes of the Means Test. The above discussion gives you a general understanding of how the Income portion of the Means Test is calculated. In future parts of this series of articles, we will examine other portions of the Means Test. As always, before making any decisions or filing for bankruptcy, you should discuss your specific situation with a qualified bankruptcy attorney. Not being able to pay your bills is, of course, a factor in making the difficult decision of filing for bankruptcy. Once making that decision, however, the next decision is whether to file for Chapter 7 or Chapter 13 (other chapters also exist, but they are not relevant to most consumers). While this decision may be made for you — based on, for example, the amount of debt you have — often you will qualify for both chapters. In that case, you must decide which will be more beneficial to you. The major and most basic difference between these two varieties of bankruptcy protection available to most consumers is that, in a Chapter 7, you effectively “raise your hands and quit,” informing your creditors that you simply have nothing left. If you do not own a house or other property, and your income is just enough to make ends meet but not enough to save each month, then a Chapter 7 will probably be the right choice for you.